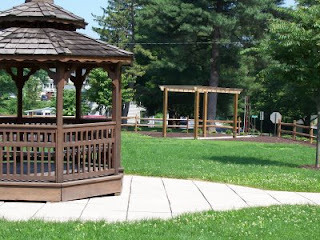 In Elizabethtown, we are a far cry from the buffoonery found on NBC show "Parks and Recreation," starring Amy Pohler, when it comes to our own places where residents relax, exercise and enjoy the outdoors. In fact, Borough Council recently spent an evening touring the community park with four borough staff members to get a first-hand look at what all of us agree is a gem for the community. The park, which stretches from Chestnut Street (where you can watch softball from the outfield) to Cherry Alley near Christ Church United Church of Christ. In between are the Fun Fort playground, a basketball court used nearly 12 months of the year, pavilions, picnic tables, swings -- the whole gamut that a resident would expect. Which is why Borough Council spent an evening wandering through the park. Expectations from residents are high, and our staff members walked us through some of the projects that are taking place and others that are on the list of things to be done. Memorial area: At South Mount Joy Street and Ken Lane, on the east side of the Fun Fort, the boroug h in recent years has started memorial area that is beginning to take shape. Stairs have been built from the intersection to the grassy area, along with several hardscape features and some flower beds. The intent is for community members to memorialize their loved ones by purchasing trees or other plants in this area. The borough has worked with a landscape designer who came up with a plan about what types of trees and shrubs to plant and where to plant them. All prices ranges are available, and the types of plant materials include Mount Fuji cherry trees, Zelkova Green Vase, Eastern Red Buds, azaleas, hollies and dogwoods. Residents who wish to plant something in memory of a loved one can call Roni Ryan at the borough office. Area along Verdant Alley: The area along Verdant Alley off Spruce Street will see new restrooms and pathways that are ADA compliant and guiderails along the alley to protect the play area below. The borough is seeking grant funding for this project. Resurface basketball court: The basketball court along Washington Street is perhaps the second heaviest used feature in the park, behind the Fun Fort. Residents are frequently playing pick-up games, sometimes well into the winter. With all of the use the court gets, it needs resurfacing. The borough has budgeted the work for 2009, but in the current economy and other pressing needs, the work may be deferred. Water fountain on Ken Lane: The borough plans to install a water fountain in front of the restrooms on Ken Lane across from the memorial area. While some of the projects seem mundane, such as new roofs on a storage facility and the former Boy Scout house along Verdant Alley, all the projects are relevant to maintaining a quality park system.